A Disney vacation is always special, but it is even more special if it is your first visit to Disneyland or California Adventure. Some families love the experience so much that they buy annual passes and visit the theme park on multiple occasions every year. Disney veterans have seen it all and know how to enhance their experience. If this is your first visit, or you have not been to Disneyland in a decade, here are a few reminders of how you can have a really fun time at the two Parks. There are two equally important elements to a great Disney vacation. The first part is planning before you enter Disneyland or California Adventure. The second part is developing a strategy for going on rides and experiencing Disney once you enter. Attitude is everything in life and that should also apply when you are in Anaheim to visit Mickey’s place. While everyone grimaces a little at the high-cost of tickets, don’t let money spoil your experience. Plan to spend more on everything from a cold beverage to a Goofy T-shirt. One of the first decisions you’ll need to make is where to stay. The three Disney Resort hotels are all very nice and very convenient to the entrance to Disneyland and California Adventure. However, they can also be fairly expensive. In Anaheim, there are hundreds of hotels within a few miles of Disney. The Anaheim Express Inn Maingate, for instance, is only a short walk from the entrance to Disneyland or California Adventure. Room rates are always among the best in town and when you consider the high-level of service, free breakfast, and many other amenities, you can’t beat the value. Plan on getting to Disneyland or California Adventure early. If you get there when the gates open, you won’t have to wait in long lines to get on your favorite rides. Usually, lines are the shortest before 11:00 am. You can also save some time by taking advantage of the FastPass system for the most popular attractions like Indiana Jones and Star Tours. With FastPass, you can avoid the long lines of the general public and quickly enter the ride during your designated time frame printed on the pass. Eating meals during off-hours can be a real time-saver. Avoid the busy lunch rush (around 11:00 am to 2:00 pm) and you probably won’t have to wait to be seated. While everyone is eating, you can slip into some rides without having to deal with long lines. The secret to a good Disney experience is to avoid waiting in lines while still being able to see everything you want to see. Finally, a day at Disney can be exhausting. If you are staying at the Anaheim Express Inn Maingate or other hotel within easy walking distance of the Park, why not take a midday break? Go back to the hotel and relax for a few hours. Let the kids swim in the pool, maybe grab some lunch outside of Disney, and then return refreshed in the late afternoon. 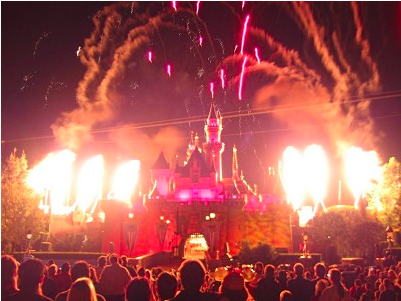 Disney at night – lights & fireworks – is a whole different experience than Disney during the day.